Notice: All Floridians and wannabe mousketeers. 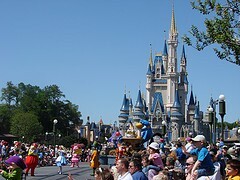 I, along with the Grove City College, Marching Wolverine and Jazz Band, will be performing this Friday at Disney World. If you’re close, please come down and say hello! The best spot to catch me (and us!) will be at 11:20 a.m. on Friday, the 24th at the Magic Kingdom Galaxy Palace Theater (located in Tomorrowland), where I will be directing the our Disney Jazz Band Combo. It’s a full jazz layout, including 5 saxophones, 4 trumpets, 4 trombones, plus piano, guitar, bass guitar, and set. Here’s to a Magical day!